To me, a “flipped lesson” can be a valid form of the old-fashioned concept of ‘prep’. Something students can do to prepare for a class. Particularly if the planned lesson relies on familiarity with concepts that (should have) been studied some time ago, or is set in a context that is unfamiliar to the students. In the past this kind of preparation task would have involved reading; quite often a teacher prepared passage for comprehension with questions to check understanding (and motivate students to engage with the material). So I have been experimenting with flipping in two ways. First the students were asked to watch a couple of short videos. Recently I asked upper sixth students to watch the Khan Academy introductory lessons on ‘Magnetism’ before we began an A level treatment f the subject. Rather than ask them to answer questions, I asked the students to record what questions they wanted answered having watched the videos. 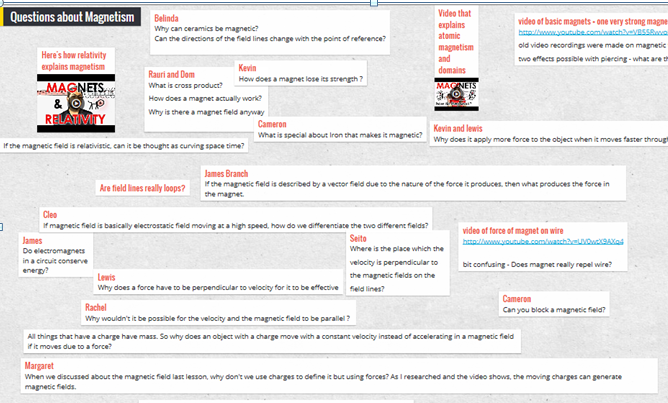 I used Padlet (see below) as a notice board for the students to record their queries. I have two groups in parallel, so they could see each others’ thoughts. The students’ questions influenced what I included in the following lessons. At the end of the classes I displayed the Padlet board and students discussed what had been answered and what hadn’t. I added links to other videos that clarified some ideas that had been queried (most relevant from Veritasium, One Minute Physics). I am happy that nearly all the students posted questions. After my lessons and the extra video links people either said their questions were answered, or asked more questions (hooray!). I think that seeing each others’ queries encouraged some of them to think more deeply – but that’s anecdotal from my knowledge of the individual students. I moved their sticky note questions around to group similar queries, then posted a relevant video link next to them. This also allowed for differentiation. I only posed one stimulus question (Are field lines really loops?) as a result of lesson discussion, another time I hope I’ll do more. On the SAMR scale of use of digital techniques in education I think this is moving from ‘Modification’ to ‘Redefinition’ as students were responding both to ideas from other students in their class, and also to those in a parallel class. Another time I’ll ask them to suggest answers or resources that answer queries. As to the four Cs, certainly communication and collaboration went on. Some critical thinking in subsequent discussion. Not so much creativity. Using TPACK to analyse what happpened, certainly there was useful content, and the technology enabled access to the content resources and communication between students. I used pedagogical knowledge to choose suitable videos. I must confess I deliberately gave them the drier Khan Academy approach first, so that my lessons and the Veritasium videos reassured (hopefully) the students that they could follow the arguments in what is a difficult subject at A level. On a technical note, I had been using Lino (http://en.linoit.com/ )for notice boards like this. I experimented with Padlet (http://padlet.com/ ) as I saw it recommended in several blogs. Padlet is extremely simple to use but I may go back to Lino as I like the colours (this may be a rather sad reason) and the different set up options so that I can monitor who is posting (essential with some classes). I’m also using student blogging so that students can read and comment on each others’ ideas – next post. This entry was posted in education and tagged flipping lesson, four Cs, lino, Padlet, SAMR, TPACK, Veritasium. Bookmark the permalink.